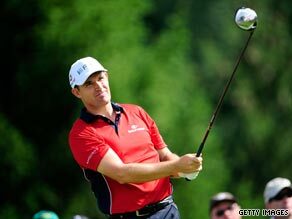 Padraig Harrington has retained his lead at the halfway stage of the Bridgestone International after carding a second successive sub-par round for the first time in four months in Akron, Ohio. The Irishman, returning to form ahead of the defense of his PGA Championship title, leads by one shot at the World Golf Championships event following a one-under-par 69 in the second round on Friday. Harrington, who will be paired with world No. 1 Tiger Woods and 2002 PGA winner Rich Beem in golf’s fourth major of the season at Hazeltine next week, was on seven-under 133 as his overnight lead lead was trimmed by one stroke. South African Tim Clark carded 68 to claim second place ahead of American Scott Verplank (69), whose compatriots Steve Stricker (69) and Jerry Kelly (65) were on four-under alongside Thailand’s Prayad Marksaeng (70). Woods, who cruised to his third Buick Open title last weekend and is a six-time winner at Firestone, was lurking in a group of nine players two strokes further back — five shots off the lead — after following up his opening 68 with a 70. He was tied for 13th with British Open champion Stewart Cink (69), U.S. Open winner Lucas Glover (69), Masters champion Angel Cabrera (68), two-time major winner Retief Goosen (67) and 1997 PGA victor Davis Love (67).